Guerilla Facilitation arises in gatherings with no formal leadership structures or when designated facilitators are inadequate or floundering. Any participant might sense how to advance a group's work by stepping up and constructively intervening in the moment. Sometimes facilitators emerge from the field. There are times and places where a facilitator is not called for explicitly but where communication is faltering, people are withdrawing or in conflict, tension is growing. Some people want/need a leader directing traffic in order to feel safe enough to participate and you won't get their buy-in otherwise. In other cases, there is already a leader/facilitator who comes in one way, which isn't working; they or someone else helps shift the agenda in response to unplanned-for (emergent) needs. Leadership can be expressed in many ways in groups. Leaders emerge from the social situation and problems at hand. Facilitation is a kind of leadership focused on enabling each member of the group to participate and focus's group attention on particular activities in order to each a goal or task that each member of the group is willing to pursue. Instructions: Since guerilla facilitation takes place in the moment, so there isn't a lot of timed sequence. Some first steps however, include volunteering to fill a role; backing up other people's efforts to facilitate; naming a need and either volunteering to fill it, or asking for someone willing to take it on. Sometimes your intervention will need discussion. Sometimes asking someone close to you what they think about some intervention is a quick way to test the water. Introducing yourself, your perception of need, and your intentions can help to allow a more extended facilitation role. Roles/Functional Interventions: Offer to take on a particular functional role (watch time, create a list who wants to speak; taking notes;). In short-term situations, people holding these these roles become an acceptable source of process interventions (see below) such as "please slow down; or could one person speak at a time," or, we have 10 minutes left, thus enabling focus and direction from everyone present. Process Interventions: involves making remarks suggesting how people can make their interactions fruitful within this time together, or offering a story line or arc of action that adds to the understanding of "where we are." "We've got a lot of gripes, does anyone have some ideas about what to do with them?" "That's a great idea, who's willing to make sure that gets done?" We're interrupting each other, how about if one person at a time talks?" (see also "process observer") "We seem to have a lot of interest in x, does anyone object to that?" Naming or simply taking care of unmet needs such as, "lets take a short break"; turning on the lights or heat if no one is taking "care of the container." Task/Content Interventions: naming problems, offering clarifying remarks about goals, data, or interpretations, or solutions to the area of interest/concern/problem solving which has brought folks together in this group. "We seem to be off topic" or "I see three solutions to this problem." (these are more associated with traditional leadership functions, not guerrilla facilitation, nevertheless in the absence of anyone making such remarks a work group process will bog down). Choosing which type of interventions can be a matter of how important the group's output is to participants or to the person offering the guerilla facilitation. Guerrilla facilitators may get push back or resistance, if others perceive a greater benefit to keeping things spontaneous/open-ended; it's possible though that this push back may reflect someone's individual distrust of you personally, of leadership or structure in general. In some cases there may be a goal that someone is not yet putting forward ("hidden agenda"), who disagrees around the particular task at hand, or has an urgent desire to avoid conflict or dissonance around an "emergent truth." The point shouldn't be about arguing. You might ask yourself if the facilitation is only in your own self-interest, or a shared need? Saying something about yourself, your experience, and the limits of your intentions are ways to gain short-term trust to move the group ahead in the worst of situations. From old Heart... anything need to be mined from here? "Leadership can be thought of as those practices which provide people in groups with a sense of focus, purpose, direction, and security. Leadership is potentially present in any social encounter, and does not require formal recognition or embodiment in a single person or subgroup. 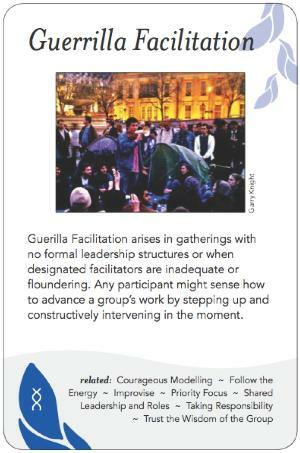 Guerilla facilitation may arise in gatherings with no formal leadership structures (an emergent group formation), or when past leadership structures have failed outright, or are floundering because of "emergent truths" or unmet needs of the group. When one or more participants intervene verbally or physically in such ways that the group finds focus toward an end goal or finds some agreements in the moment that enable communication and some form of ongoing relatedness to proceed with greater clarity. " Situation 2: In a larger conference, random people are asked to break out and discuss some problem and report back on a particular topic. No other instructions are given. Everyone is talking at once. or alternatively, no one is talking. Situation 3: people who have never met before gather to plan an anti-war protest.